Level 8 Craftling: More baby SCA clothes! A few months ago (wow, back in April), I made a couple sets of baby/toddler SCA clothes for some dear friends of mine. They have a young one and very little help taking care of her, so I hadn't seen them much and I was hoping to lure them out to SCA events by bribing them with clothes for the wee one. It worked! I saw them at two local revels this summer! 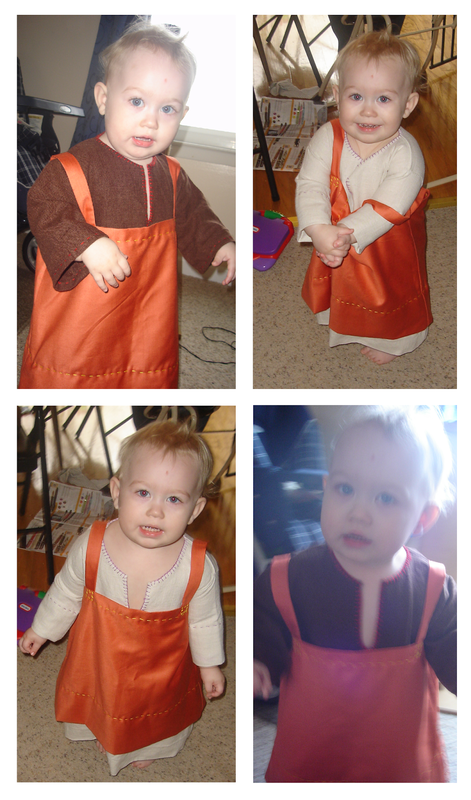 I made baby Viking garb, since it seemed the easiest - just a couple T-tunic shift dresses, and a little apron dress to go over them. The unseen seams (side seams, etc) are all made using the sewing machine, but I hand-stitched the hems. There are a few reasons for this: first, because I like hand stitching, and it was calming and nice to do so on something so small - very quick to see fun results! Second, it made the simple garments that much prettier. And finally, it's so the hems would be very easy to take out. I deliberately made the clothes adjustable so that they would hopefully fit her for a long time. The hems are HUGE. First, a little apron overdress! It's made out of a random orange fabric I have in my stash. I have no idea what this is made of. It feels like a synthetic. Second, a linen underdress! The neckline is finished with blanket stitch. I love blanket stitch - it keeps edges from fraying so well, and it's so pretty and easy! You can see how huge both the bottom and arm hems are. Another underdress! This one is a linen/rayon mix. Finally, pictures of the wonderful girl! The clothes are still a little large. The neck of the tunic can be pinned with a safety pin or viking brooch, but it had to be made large to fit over her head.